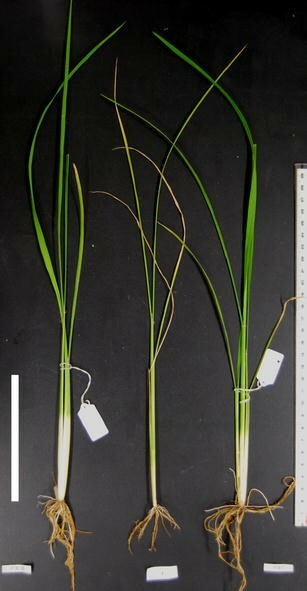 Hybrid weakness phenomena in rice reportedly have two causes: those of HWC1 and HWC2 genes and those of HWA1 and HWA2 genes. No detailed study of the latter has been reported. For this study, we first produced crosses among cultivars carrying the weakness-causing allele on the HWA1 and HWA2 loci to confirm the phenotype of the hybrid weakness and the genotypes of the cultivars on the two loci, as reported earlier. We then confirmed that these cultivars belong to Indica. Subsequent linkage analysis of HWA1 and HWA2 genes conducted using DNA markers revealed that both genes are located in the 1,637-kb region, surrounded by the same DNA markers on the long arm of chromosome 11. The possibility of allelic interaction inducing hybrid weakness is discussed. Many postzygotic reproductive barrier forms have been reported in rice (Oryza sativa), such as hybrid weakness (e.g., Oka 1957), hybrid pollen sterility (e.g., Long et al. 2008), and hybrid sterility causing female gamete abortion (e.g., Chen et al. 2008). Among them, hybrid weakness is definable as weak growth occurring in F1 hybrids derived from crosses between two normal strains. According to its degree or symptom, it is also called hybrid lethality, hybrid abnormality, or hybrid necrosis. Hybrid weakness is also apparent in many other plant species including Arabidopsis thaliana (Bomblies et al. 2007), Phaseolus vulgaris (Shii et al. 1980), interspecific crosses among Gossypium (Lee 1981), and interspecific crosses among Nicotiana (Tezuka et al. 2007). In rice, two hybrid weakness phenomena from different intraspecific cross combinations have been reported: one by Oka (1957) and the other by Amemiya and Akemine (1963). The hybrid weakness reported by Oka (1957) resulted from use of a set of complementary dominant genes: L 1 and L 2 . They were renamed L-1-a and L-1-b by Kinoshita (1984); then Hwa-1 and Hwa-2 by Sato et al. (1987). According to the new gene nomenclature system for rice (McCouch and Committee on Gene Symbolization, Nomenclature and Linkage, Rice Genetics Cooperative (CGSNL) 2008), the new gene symbols HWA1 and HWA2 are used respectively for reference to Hwa-1 and Hwa-2, as presented in Table 1. The latter phenomenon results from the use of a set of complementary dominant genes: Hybrid weakness C1 (HWC1) and Hybrid weakness C2 (HWC2). We have detected the chromosomal locations of these genes and have performed fine mapping (Ichitani et al. 2001; Ichitani et al. 2007; Kuboyama et al. 2009). However, the chromosomal locations of HWA1 and HWA2 have remained unknown. According to Oka (1957), hybrids carrying both Hwa1-1 and Hwa2-1 showed the following symptoms: germination and growth in the seedling stage were quite normal until the seedlings had developed three to four leaves, at which time growth stopped and the leaves yellowed. The phenotype differs considerably from that of hybrids carrying both Hwc1-1 and Hwc2-1, of which the symptoms are characterized by root growth inhibition appearing just 5 days after germination (Ichitani et al. 2001; Saito et al. 2007). The distribution of Hwa1-1 and Hwa2-1 genes was limited to some Indian cultivars (Oka 1957). Based on results of three-way cross combinations, Oka (1957) reported that P.T.B.10 (accession 414) and P.T.B.7 (accession 419) carry Hwa1-1 and Hwa2-1, respectively, whereas Pei-ku (accession 108), Padi ase banda (accession 647), and Kissin (accession 521) carry neither Hwa1-1 nor Hwa2-1. Oka (1957) examined many different cultivars for the distribution of these genes. The four Indian cultivars––A.D.T.4 (accession 415), A.D.T.14 (accession 417), M.T.U.9 (accession 420), and P.T.B.8 (accession 421)––showed weakness in hybrids with P.T.B.7, indicating that these four cultivars also carry Hwa1-1. Actually, accession 418, an Indian cultivar whose name is unknown, showed weakness in the hybrid with P.T.B.10, indicating that accession 418 carries Hwa2-1. All cultivars relating to this hybrid weakness belong to Indica. The other cultivars that were examined carry neither Hwa1-1 nor Hwa2-1. Information about the gene carriers of Hwa1-1 and Hwa2-1 is presented in Table 1. The molecular mechanism of the hybrid weakness has remained unknown. Elucidating the mechanism necessitates clarification of the causal genes and their gene products. We selected a map-based cloning strategy to identify the two causal genes. As a starting point of map-based cloning, this report describes the chromosomal locations of HWA1 and HWA2 genes. It is particularly interesting that both genes are located in the 1,637-kb region, surrounded by the same DNA markers on the long arm of chromosome 11. The possibility of allelic interaction inducing hybrid weakness is discussed in this report. Indian cultivars carrying Hwa1-1 or Hwa2-1 gene, P.T.B.10, P.T.B.7, and A.D.T.14, were provided by the Genebank of the National Institute of Agrobiological Sciences, Japan. We produced crosses among these three cultivars and confirmed that the F1 hybrids from the cross between P.T.B.7 and P.T.B.10, and those from the cross between P.T.B.7 and A.D.T.14 showed the weakness symptom, as reported by Oka (1957) (Fig. 1). The F1 hybrids from the cross between P.T.B.10 and A.D.T.14 showed normal growth. These results indicate that these Indian cultivars carry one of the hybrid-weakness-causing genes reported by Oka (1957). Hybrid weakness caused by two complementary genes: Hwa1-1 and Hwa2-1. Seedlings are shown 40 days after sowing date: from left to right, P.T.B.10, F1 derived from the cross between P.T.B.10 and P.T.B.7, and P.T.B.7. The F1's developed leaves have turned yellow from the tip. Bar shows 10 cm. Oka (1957) reported that all cultivars related to this hybrid weakness belong to Indica. If that is true, then the mapping population of HWA1 and HWA2 should be constructed from the cross between these cultivars and Japonica cultivars because DNA polymorphism between Indica cultivars and Japonica cultivars is frequently observed. To confirm the classification by Oka (1957), the three Indian cultivars were compared with 13 reference cultivars (see Materials and methods for details) with respect to the banding patterns of polyacrylamide gel electrophoresis of 39 PCR-based insertion/deletion (indel) markers covering all 12 rice chromosomes (Fig. 2, Table 2). Classification of the Indian cultivars carrying Hwa1-1 or Hwa2-1 gene and 13 reference cultivars into four varietal groups based on banding patterns of 39 DNA markers covering all 12 rice chromosomes. DNA markers with an asterisk (*) were developed by RGP (http://rgp.dna.affrc.go.jp/E/publicdata/caps/index.html); those without an asterisk were developed in this study (Table 2). The same banding patterns as Nipponbare are indicated as solid rectangles. Other patterns are shown as open and shaded rectangles. Shown above are genetic relations among the 16 cultivars obtained using UPGMA cluster analysis. Each fragment size of the 39 markers was treated as a unique characteristic and scored as present (1) or absent (0). The data matrix was used to calculate genetic similarities using the Jaccard (1908) coefficient. The relations among the 16 cultivars were revealed by UPGMA cluster analysis (Fig. 2). The 16 cultivars were classified clearly into two groups corresponding to Japonica and Indica. All cultivars related to this hybrid weakness belong to Indica, which is consistent with the report by Oka (1957). The Japonica group was divided into temperate Japonica and tropical Japonica. The four cultivars in temperate Japonica showed the same banding patterns with 39 DNA markers, except that J-147 showed a different pattern with KGS1797. The three cultivars in tropical Japonica showed the same banding patterns as temperate Japonica does with 28 DNA markers. The Indica group was divided into two subgroups, with one subgroup comprising IR36, IR24, Guangluai 4, and A.D.T.14, and the other comprising Kasalath, Kele, Dular, P.T.B.10, and P.T.B.7. Garris et al. (2005) classified 234 rice cultivars into five groups: indica, aus, aromatic, temperate japonica, and tropical japonica. Then IR36 was categorized into indica, and Kasalath into aus. In the present study, according to Garris et al. (2005), the subgroup comprising Kasalath and the other subgroup comprising IR36 will be designated respectively hereinafter as aus and indica (Fig. 2). Regarding the three cultivars related to this hybrid weakness, A.D.T.14 was found to belong to indica, whereas P.T.B.7 and P.T.B.10 belong to aus. The three cultivars proved to belong to Indica, as reported by Oka (1957). They showed polymorphism with Japonica cultivars with high frequency (Fig. 2). We selected a Taiwanese temperate Japonica cultivar Taichung 65 (T65) and produced hybrids among the three Indian cultivars and T65 because much polymorphism has been noted among the three Indian cultivars and T65. Furthermore, because it is weakly photoperiod sensitive, hybridization between T65 and other cultivars can be accomplished more easily. All hybrids from crosses between T65 and the three cultivars showed normal growth, indicating that T65 carries neither Hwa1-1 nor Hwa2-1. Then, linkage analysis of HWA1 and HWA2 was conducted using a three-way cross population. For the location of HWA1, the F1 plants derived from the cross between T65 and P.T.B.10 were crossed with P.T.B.7. The three-way cross population [P.T.B.7 × (T65 × P.T.B.10)] (n = 176) was divided into 105 weak plants carrying both Hwa1-1 and Hwa2-1, and 71 normal plants carrying only the Hwa2-1 gene. The observed ratio did not fit the expected ratio 1:1 (χ2 = 6.57, P = 0.01038). We inferred that the deviation from the expected ratio was probably caused by the linkage between HWA1 gene and gametophytic reproductive barrier gene(s), which is often found in crosses between Indica and Japonica (see Discussion). Six typical weak plants and six typical normal plants were selected from the three-way cross population. They were subjected to preliminary linkage analysis with 83 DNA markers distributed on the whole rice genome (for details, see Materials and methods). A clear linkage was detected between HWA1 and DNA markers on the long arm of chromosome 11, RM5349 (McCouch et al. 2002), and RM224 (Chen et al. 1997). Linkage of HWA1 with RM5349 and RM224 was confirmed by adding the 82 three-way cross plants (Fig. 3). Linkage map showing the location of HWA1 and HWA2 on rice chromosome 11. a RFLP framework map of chromosome 11 quoted from Harushima et al. (1998). b Linkage map of HWA1 constructed from the three-way cross population [P.T.B.7 × (T65 × P.T.B.10)] (n = 176). c Linkage map of HWA2 constructed from the three-way cross population [A.D.T.14 × (T65 × P.T.B.7)] (n = 175). Genotypes of RM5349 and RM224 were analyzed for 94 plants in HWA1 mapping and for 96 plants in HWA2 mapping to know if these genes are located between the two markers. *, **, ***, and **** mean that the gene segregation was significantly deviated from the expected ratio (1: 1) at 0.05, 0.01, 0.001, and 0.0001 levels, respectively. Along with the mapping of HWA1, linkage analysis of HWA2 was performed using the same strategy. The F1 plants derived from the cross between T65 and P.T.B.7 were crossed with A.D.T.14. The three-way cross population [A.D.T.14 × (T65 × P.T.B.7)] (n = 175) was divided into 110 weak plants carrying both Hwa1-1 and Hwa2-1, and 65 normal plants carrying only the Hwa1-1 gene. The observed ratio did not fit the expected ratio 1:1 (χ2 = 11.57, P = 0.00067), probably because of the reproductive barrier, as described above. Six typical weak plants and six typical normal plants that had been selected from the three-way cross population were subjected to preliminary linkage analysis with 84 DNA markers distributed throughout the rice genome (see Materials and methods), indicating that HWA2 was also linked with RM5349 and RM224. Linkage of HWA2 with RM5349 and RM224 was confirmed by adding the 84 three-way cross plants (Fig. 3). We selected seven and eight polymorphic simple sequence repeats (SSR) markers reported by the International Rice Genome Sequencing Project (IRGSP) (2005), respectively, for mapping of HWA1 and HWA2. Linkage analysis using these markers revealed a large gap separating RM26943 and RM27051 (Fig. 3). Although we also examined several published SSR markers in IRGSP (2005), they were not applicable to the linkage analysis. To fill the gap, we detected a four-base-pair indel between Nipponbare and Kasalath by comparing the genome sequence of Nipponbare and the BAC-end sequence of Kasalath in the chromosomal region. The PCR products from the primer pair encompassing the indel showed clear banding patterns. Polymorphism between Nipponbare and Kasalath was conserved between T65 and the three Indian cultivars. The DNA marker using this indel was named KGC11M1 (Table 2), which we added to the linkage analysis. The linkage analysis of HWA1 and eight DNA markers using 176 three-way cross plants showed that HWA1 was located between KGC11M1 and RM27122, and that it cosegregated with RM27051 and RM27068 (Fig. 3). Linkage analysis of HWA2 and nine DNA markers using 175 three-way cross plants showed that HWA2 was also located between KGC11M1 and RM27122, and that it cosegregated with RM27051 and RM27068 (Fig. 3). To sum up, both HWA1 and HWA2 genes cosegregated with RM27051 and RM27068, located on the 1,637-kb region surrounded by KGC11M1 and RM27122 on the long arm of chromosome 11. In this study, both HWA1 and HWA2 were located between the two DNA markers on chromosome 11: KGC11M1 and RM27122. Harushima et al. (1998) constructed an often-cited restriction fragment length polymorphism (RFLP) marker-based high-density linkage map for rice, in which some RFLP markers have been sequenced. Based on Nipponbare genome sequence, KGC11M1 and RM27122 were close to the two RFLP markers R2458 and G1465, which were reported respectively at positions 89.8 and 98.4 in the map by Harushima et al. (1998). That location indicates that HWA1 and HWA2 are in the chromosomal region surrounded by these markers (Fig. 3). In the three-way cross-mapping populations, gene segregation was not fitted to the expected ratio, but it was skewed toward weakness-causing alleles for both HWA1 and HWA2 loci. Sawamura and Sano (1997) reported that P.T.B.10 carries a gamete eliminator of S 11 (t), which is linked to la on chromosome 11. The P.T.B.10 allele S 11 (t) induces abortion of gametes carrying the T65 allele S 11 a (t) only in heterozygotes. The recombination value between S 11 and la (lazy habit) was estimated to be 0.06 ± 0.03 to 0.23 ± 0.23. Miura et al. (2003) conducted linkage analysis of la with RFLP markers. The la gene was located between R728 and C459B, of which the positions were 63.8 and 65.2, respectively, in the map by Harushima et al. (1998). These experimentally obtained results suggest that distorted segregation at the HWA1 locus in the three-way cross [P.T.B.7 × (T65 × P.T.B.10)] is attributable to S 11 (t) linked to Hwa1-1. Distorted segregation at the HWA2 locus in the three-way cross [A.D.T.14 × (T65 × P.T.B.7)] reports that P.T.B.7 might carry the S 11 (t) allele at S 11 (t) locus. The heterozygote (S 11 (t)S 11 a (t)) induces female and male infertility (Sawamura and Sano 1997). The fact that F1 plants from the cross (T65 × P.T.B.10) and those from the cross (T65 × P.T.B.7) both showed semi-sterile panicles (Ichitani et al. unpublished results) also suggests that a gamete eliminator such as S 11 (t) is attributable to the segregating distortion in both cross combinations. However, the peaks of distortion differed between the two populations, implying that a gene(s) other than S 11 (t) was responsible for the distortion in the three-way cross [A.D.T.14 × (T65 × P.T.B.7)]. Two genetic models can explain hybrid weakness. According to one model, hybrid weakness results from interaction among non-allelic genes: the causal genes of another hybrid weakness in rice, HWC1 and HWC2, are located on the different chromosomes (Ichitani et al. 2007; Kuboyama et al. 2009). This case is true for the A. thaliana case (Bomblies et al. 2007). The candidate genes in the mapped regions of HWC1 and HWC2 do not mutually overlap; they belong to distinct gene families. The other model suggests allelic interaction: a hybrid necrosis symptom observed in interspecific crosses among Gossypium was explained by interlocus and intralocus interaction, shown respectively by the dominant Le 2 dav gene from Gossypium davidsonii at Le 2 locus and Le 1 and/or Le 2 , dominant alleles from Gossypium hirsutum at the Le 1 and Le 2 loci (Lee 1981). These two loci are thought to be on mutually homoeologous chromosomal segments on the G. hirsutum allotetraploid genome (Samora et al. 1994). Increased gene dosage of Le 1 and Le 2 with Le 2 dav reportedly hastens necrosis (Rooney and Stelly 1990). In the Gossypium case, no candidate gene information was reported. Regarding the reproductive barrier in rice, causal genes were cloned in an allelic interaction case: heterozygotes of Indica allele S5-i and Japonica allele S5-j at the S5 locus induce embryo-sac semi-sterility caused by partial abortion of female gametes carrying the Japonica alleles. Chen et al. (2008) cloned the S5 gene, demonstrating that S5 encodes an aspartic protease conditioning embryo-sac fertility, the allelic difference being very small at the sequence level. Chen et al. (2008) did not explain the molecular mechanism caused by the heterozygous form at the S5 locus. In another case, causal genes of reproductive barrier in rice, which had been thought to be allelic before, proved to be a complex of two very tightly linked genes. At the hybrid male sterility locus Sa, heterozygotes of Indica allele Sa i and Japonica allele Sa j exhibited male semi-sterility. Long et al. (2008) cloned the Sa gene, finding that it comprises two adjacently located genes, SaM and SaF, which respectively encode a small ubiquitin-like modifier E3 ligase-like protein and an F-box protein. Most Indica cultivars contain a haplotype SaM+SaF+, whereas all Japonica cultivars have SaM−SaF−. Interaction of SaM− and SaF+ in the presence of SaM + is necessary for this male sterility. In this study, the physical distance between the KGC11M1 and RM27122 markers was found to be 1,637 kb. According to the Rice Genome Annotation Project (Ouyang et al. 2007, http://rice.plantbiology.msu.edu/), more than 100 genes are located in the region. We were unable to determine whether Hwa1-1 and Hwa2-1 are allelic or not, but the possibility exists that heterozygotes induce the hybrid weakness symptom. To elucidate their relations, whether by tight linkage or allelism, larger mapping populations must be analyzed. A causal gene controlling hybrid necrosis in Arabidopsis was cloned. Reportedly, it encodes an NB-LRR protein (Bomblies et al. 2007). We fine-mapped HWC2 gene in rice, and narrowed down the area of interest to 19 kb, identifying five candidate genes, one of which encodes an NB-LRR protein (Kuboyama et al. 2009). Alcázar et al. (2009) fine mapped a causal gene of incompatibility or hybrid breakdown to a cluster of TIR-NB-LRR genes in Arabidopsis. Yamamoto et al. (2010) reported that hbd3, a causal gene controlling hybrid breakdown in rice, is located on the cluster of NB-LRR genes. These reports suggest that plant immune systems conditioned by NB-LRR protein(s) induce hybrid weakness, as reported by Bomblies and Weigel (2007). According to the Rice Genome Annotation Project (Ouyang et al. 2007, http://rice.plantbiology.msu.edu/), two NB-LRR disease-resistance gene homologs, LOC_Os11g39160 and LOC_Os11g39260, and ten disease resistance-related genes containing NB-ARC domain are located on the target region of HWA1 and HWA2, implying that these genes are causal genes. However, many other genes are also located in the target region. No NB-LRR disease resistance gene homolog is located in the HWC1 target region (Ichitani et al. 2007). To clarify the fundamental mechanism causing hybrid weakness, many cross combinations causing hybrid weakness in various species should be studied at the molecular level. The cloning of HWA1 and HWA2 might provide new information related to hybrid weakness. Results of cluster analysis show that A.D.T.14 carrying Hwa1-1 belongs to indica, whereas P.T.B.10 carrying Hwa1-1 and P.T.B.7 carrying Hwa2-1 belong to aus, which suggests a lack of relation between varietal differentiation and the genotypes at the HWA1 and HWA2. However, the three cultivars are insufficient to support discussion of the distribution of these genes. Having learned recently that all the plant materials used by Oka (1957) have been maintained in the National Institute of Genetics, Japan, we plan to use these cultivars to find Hwa1-1- or Hwa2-1-specific conserved haplotypes of DNA markers. Regarding HWC2 genes, we found that the DNA marker banding patterns of 14 markers surrounding the HWC2 locus were conserved completely among the 13 Hwc2-1 carriers (Kuboyama et al. 2009). We will find potential carriers with the aid of DNA markers from our rice germplasm collection and make test crosses to determine whether they really carry the genes if such a haplotype is found in the Hwa1-1 or Hwa2-1 carriers. We plan to add these gene carriers in the cluster analysis to confirm the relation between varietal differentiation and these genes. The increase in the number of gene carriers might disclose conserved haplotypes in the HWA1 or HWA2 locus, which help to identify the causal genes. To identify the causal genes and to confirm whether they are allelic or not, we are undertaking high-resolution mapping and linkage disequilibrium analysis of both HWA1 and HWA2 genes. We have also started physiological and close morphological analyses of the hybrid weakness. In three-way cross populations, there existed a few intermediate type plants between normal and weak ones, partly because of diverse genetic backgrounds in the populations (see Materials and methods). We are introducing the Hwa1-1 gene from P.T.B.10 and A.D.T.14, and the Hwa2-1 gene from P.T.B.7 in T65 genetic background by backcrossing to develop near-isogenic lines of these genes. Using these near-isogenic lines, we will evaluate the effects of these genes more exactly. The three cultivars related to this hybrid weakness, P.T.B.7, P.T.B.10, and A.D.T.14, were compared with the 13 reference cultivars with regard to the banding patterns of polyacrylamide gel electrophoresis of 39 PCR-based indel markers (Fig. 2). Among the cultivars, Nipponbare and Koshihikari are improved Japanese cultivars, and T65 is an improved Taiwanese cultivar. These three cultivars are generally classified as temperate Japonica. J-147 is a native cultivar in Japan (Sato and Morishima 1988). Ketan Nangka, Azucena, and Jamaica are native cultivars respectively originating in Malaysia, the Philippines, and Peru. They are generally classified as tropical Japonica. Three cultivars generally classified as Indica are Guangluai 4, an improved Chinese cultivar, and IR36 and IR24 developed by the International Rice Research Institute. Kele, Dular, and Kasalath cultivars are native to India. Kele and Dular are categorized as aus in Wan and Ikehashi (1997). Kasalath has been categorized as Indica in many studies; DNA marker polymorphism has been observed with high frequency between Kasalath and Japonica cultivars. According to classification by Garris et al. (2005) based on SSR markers or Zhao et al. (2010) based on single nucleotide polymorphism—which divided rice cultivars into temperate japonica, tropical japonica, indica, aus, and one more group—Nipponbare and Koshihikari were classified as temperate japonica, Azucena as tropical japonica, IR36 as indica, Kasalath as aus, and Dular as admixed. For hybridization, flowering times of plant materials were mutually synchronized by the use of many sowing dates. Seeds were sown in nurseries with plant spacing of 3 × 3 cm. One month after sowing, seedlings were transplanted in a paddy field in the experimental farm of Kagoshima University. The three-way cross populations in which HWA1 or HWA2 gene segregated were grown in nurseries along with parental cultivars and F1 plants inducing the weakness. Plant spacing was 3 × 6 cm. The DNA of the cultivars used in the cluster analysis was extracted according to Dellaporta et al. (1983) with some modifications. The DNA of the mapping populations was extracted according to the experimental protocols of Rice Genome Research Program (RGP) (http://rgp.dna.affrc.go.jp/E/rgp/protocols/index.html, written in Japanese) with some modifications. Briefly, each young leaf tip, 2 cm long from a single plant, was put on a well in a 96-deep well plate. Then 100 μl of extraction buffer (100 mM Tris–HCl (pH 8.0), 1 M KCl, and 10 mM EDTA) were added with a 5-mm-diameter stainless steel ball in a well. After covering with a hard lid, the plate was shaken hard (ShakeMaster ver. 1.2; BioMedical Science Inc.) for a minute to grind the leaves. After centrifuging, a plate was incubated at 70°C for an hour. Then 9 μl of supernatant was recovered and 7 μl of 2-propanol was added. After centrifuging, the supernatant was discarded and the DNA pellet was rinsed with 50 μl of 70% ethanol. The DNA pellet was dried and dissolved in 50 μl of sterilized distilled water. The PCR conditions for indel and SSR markers used for this study were 95°C for 10 min, 40 cycles of 94°C for 30 s, 55°C for 30 s, and 72°C for 30 s with subsequent final extension of 72°C for 1 min. The PCR mixture (5 μl) contained 1 ml of template DNA, 200 mM of each dNTP, 0.2 μM of primers, 0.25 units of Taq polymerase (AmpliTaq Gold; Applied BioSystems), and 1× buffer containing MgCl2. The PCR products were analyzed using electrophoresis in 10% (29:1) polyacrylamide gel with subsequent ethidium bromide staining and were viewed under ultraviolet light irradiation. Most PCR–based DNA markers used for this study have already been published: Markers with an asterisk in Fig. 2 were designed by RGP (http://rgp.dna.affrc.go.jp/E/publicdata/caps/index.html). Information related to SSR markers was obtained from Panaud et al. (1996), Chen et al. (1997), Temnykh et al. (2001), McCouch et al. (2002), and IRGSP (2005). Some primer pairs did not perform well. Therefore, we redesigned them or developed new DNA markers. Most of the new markers were based on the indel between Nipponbare and an indica cultivar 93–11 (Shen et al. 2004) or those between Nipponbare and Kasalath or an indica cultivar Guangluai 4 (Monna et al. 2006). Markers were named by adding KG to the original indel information ID, R*** (Shen et al. 2004) or S**** (Monna et al. 2006). In redesigning or developing DNA markers, we made alignments of Nipponbare genome sequence (IRGSP 2005), 93–11 genome sequence (Yu et al. 2002) and/or BAC-end sequence of Kasalath (http://rgp.dna.affrc.go.jp/blast/runblast.html, Katagiri et al. 2004) using DNAsis Pro (Hitachi Software Engineering Co.). Primer design was performed using Primer 3 (Rozen and Skaletsky 2000). The sequences of primers designed in this study are presented in Table 2. Genetic relations among the 16 cultivars (Fig. 2) were evaluated using the 39 DNA markers. Each fragment size was treated as a unique characteristic, and scored as present (1) or absent (0). The data matrix was used to calculate genetic similarities using the Jaccard coefficient (Jaccard 1908). A phenogram was constructed using the unweighted pair-group method with the arithmetic mean (UPGMA) with software (NTSYS-pc ver. 2.2; Exeter Software). About 1 month after the sowing date, the seedlings in the three-way cross populations, [P.T.B.7 × (T65 × P.T.B.10)] (n = 176) and [A.D.T.14 × (T65 × P.T.B.7)] (n = 175), developed three to four leaves. Plants of two types appeared. One type was characterized by the yellowing of leaf tips and weak growth as F1 plants (Fig. 1). It was categorized as a weak plant carrying both Hwa1-1 and Hwa2-1 genes. Another type showed normal growth as parental cultivars. It was categorized as a normal plant carrying only Hwa1-1 or Hwa2-1. The tips of lower leaves of normal plants sometimes yellowed also, but the tips of upper leaves remained green. In contrast, in weak plants, all leaf tips except those of the youngest (still expanding) ones yellowed. Therefore, the difference between weak plants and normal plants was clear in most cases. A few intermediate type plants could not be categorized into the above two types. They were excluded from analyses. For HWA1 mapping, a total of 83 DNA markers distributed on the whole rice genome were used: 24 polymorphic indel markers in Fig. 2, an indel marker named S21074 designed by RGP, another indel marker named Knindel1 (Matsubara et al. 2007), a sequence characterized amplified region (SCAR) marker named d (Ueda et al. 2005), and 56 published SSR markers. For HWA2 mapping, a total of 84 DNA markers distributed on the whole rice genome were used: the 23 polymorphic indel markers presented in Fig. 2, 59 SSR markers, and two indel markers designed by RGP—S21074 and S5865. In each mapping population, six typical weak plants and six typical normal plants were selected and subjected to preliminary linkage analysis with DNA markers, with the result that the linkage of HWA1 and HWA2 with RM5349 (McCouch et al. 2002) and RM224 (Chen et al. 1997) was visible on the long arm of chromosome 11. Then linkage analysis using all the plants in the mapping populations and polymorphic DNA markers surrounded by RM5349 and RM224 was conducted using a computer program (MapDisto ver. 1.7; Lorieux 2007). Map distances were estimated using the Kosambi function (Kosambi 1944). We gratefully acknowledge Dr. Atsushi Yoshimura of Kyushu University and Dr. Lisa Monna of the Plant Genome Center for valuable information related to DNA polymorphism in rice. We are also grateful to Dr. Yo-Ichiro Sato of the Research Institute for Humanity and Nature, the Genebank of the National Institute of Agrobiological Sciences for the kind provision of rice cultivars. This work was funded by the Ministry of Education, Culture, Sports, Science and Technology. Lorieux M. 2007. MapDisto, a free user-friendly program for computing genetic maps. Computer demonstration (p958) given at the plant and animal genome XV conference, Jan 13–17 2007, San Diego, CA. URL: http://mapdisto.free.fr/.